Many trains and hubs have been built America, but in most places we don’t use train stations like we used to. A major exception to this is Grand Central Station in New York City. Probably the most famous train station in the USA, Grand Central station is a piece of history, and an enduring testament to industrialized people moving. Trains also needed to be on time. Brands like Ball and Hamilton like to discuss their heritage in making “railroad” watches that were used to reliably keep trains running on schedule. Aside from train tracks, the second most important type of fixture in a station are the clocks. Time is inherently linked to train stations, and checking your watch to make sure you don’t miss your train is part of the experience. Give this notion, and the simple fact that it was a good place to catch people on a daily basis, 60 years ago a small watch repair stand opened in Grand Central Terminal simply called Central Watch Band. It existed to make watch repairs and to replace watch straps. Hardly a store at all, Central Watch lived among florists, food vendors, and news stands. As many of these businesses came and went, Central Watch remained. 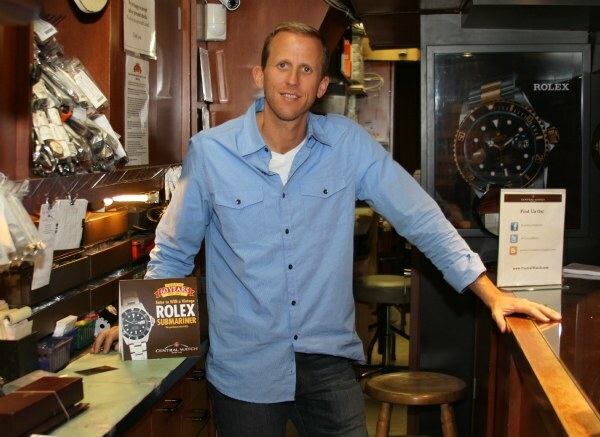 Third generation Central Watch owner Steve Kivel never intended on perpetuating the family business. His grandfather Max opened the show in 1952, and his father Larry later handed the operation over to Steve – who was always intent on doing something else with his life. Perhaps it was that watch making was in his DNA that kept him at Central Watch. His father Larry is still at the shop working on watches regularly. Just walking by the out-of-the way watch repair stand hardly delivers the message of what Central Watch is. Most of its operation is hidden from view in a long narrow space behind the stand. Over the years, Central Watch took over a few adjacent stands which now display watches for sale and contain watch maker desks. The space is almost comically quaint. I likened it to feeling like an office in a train car – while Steve corrected me that it was more like a submarine. New space should be on the way soon. Central Watch sells new and vintage timepieces but the bulk of their business is still in the repair field. According to Mr. Kivel, about 85% of their business is fixing watches. That is a lot of watches as Kivel claims some days the stand takes in over 100 new pieces. This is fortunate because Central Watch is really good at what they do. I did some research and found that their claims of being one of the best places to get your watch repaired in New York City is backed up by a lot of people. In fact, they are probably one of the best watch repair operations in all of the United States. People come to Central Watch from all over the New York metro area, and they get mail shipments all the time. Central Watch has built a loyal following due to their skill and attention to detail. Kivel is quick to point out mistakes that other watch repair shops are regularly guilty of. According to him it isn’t a matter of honesty, but rather time and skill. Most watch makers are overworked, underpaid, and under-educated. You need the right parts and the right education. Central Watch has direct relationships with most of the big watch makers – especially Rolex, whom they have been buying parts from for decades. Kivel would love to expand and hire more watch makers, but they aren’t as easy to find as one might imagine. Large brands pluck up the best people, but many like the prospects of working at a place like Central Watch. In addition to servicing watches for the general public, Central Watch is also retained by many large stores to service the watches that they sell. They go to Central Watch for their honest work and high level of workmanship. Central Watch has a reputation for doing what is necessary to get it done right the first time. There are just too many stories about situations where people send watches to even the original brand – only to get the watches back with the same problem (or new ones), and a large bill. In a totally non-self-aggrandizing manner, Kivel speaks matter-of-factly about the business of watch repair as a delicate art that must be approached in the right manner. Otherwise, mistakes are almost guaranteed to be made. Those who understand this are justifiably intimidated about getting their watches fixed. It is unfortunately often an unpleasant experience – but it doesn’t have to be. 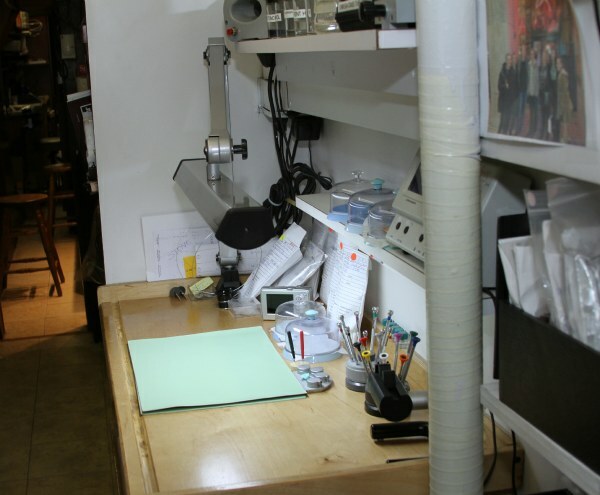 Standing in the narrow passage that is the inner-office of Central Watch, Kivel points out some of the machines and instruments used regularly by himself and the other watch makers. Modern and old equipment clutter the already cramped space. It is amazing what they are able to accomplish in the shop. In a sense, it is almost allegorically appropriate, as watch making itself is about doing a lot in a small space. 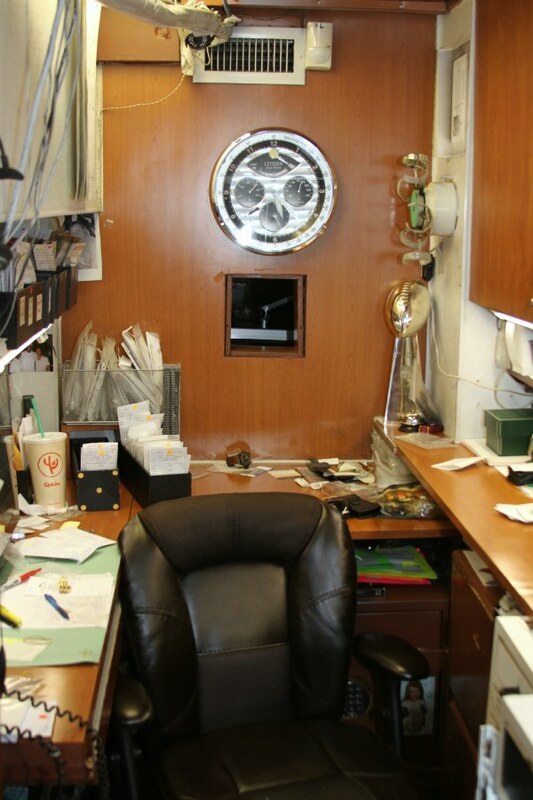 Central Watch is a full service watch repair shop. They can work with new and vintage watches, and even perform complex restoration projects. Kivel admits to preferring to work on new watches. One reason is that they are usually untouched by other watch makers who didn’t know what they were doing. The second reason is a testament to modern technology, being that in his opinion watch movements are (mostly) made better today than ever before. It goes without saying that they also service quartz watches, and perform basic services such as strap and battery replacements. As expert watch makers, Central Watch is further able to work on pocket watches as well as clocks. What goes on at Central Watch is not only rare, but uniquely American. It also comes with no surprise that Central Watch is alive and thriving in New York City. Being here makes you understand why America was, and still is a superb market for high-end watches. Nowhere else in the US (at least where I have been) can you see so many wonderful pieces in such a small area. From the bankers and brokers, to the buyers and barterers, this is a place where a good watch is desired and appreciated. Central Watch is there when repairs are necessary. Fixing a mechanical watch is not cheap. Kivel laments that their prices have had to go up over the years. “We were honestly charging too little for a long time, but we needed to raise our prices. Still, we offer a lot for the money”. 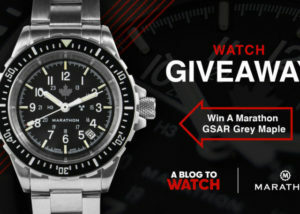 For your dollars, you get a solid day of work and attention from someone who sees that watch servicing is done right. It honestly isn’t a short task, requiring hours of work and many steps. Unless you are talking about a very basic repair, most servicing will run several hundred to over a thousand dollars. In many instances that is still cheaper than what the brands will charge. My ongoing advice to watch lovers is that unless you have to send your watch back to the brand for repair – a good third-party repair guy (or gal) is preferred. If it wasn’t for rather steep increases by Grand Central Terminal in the rent over the years – Central Watch prices would be much lower. Kivel comes across as a man who first and foremost has a passion for doing the job right. Many of his customers are long time clients. I overheard Steve and one gentlemen small talking like old friends while settling the bill on a serviced Patek. It feels like a family business because it actually is a family business. 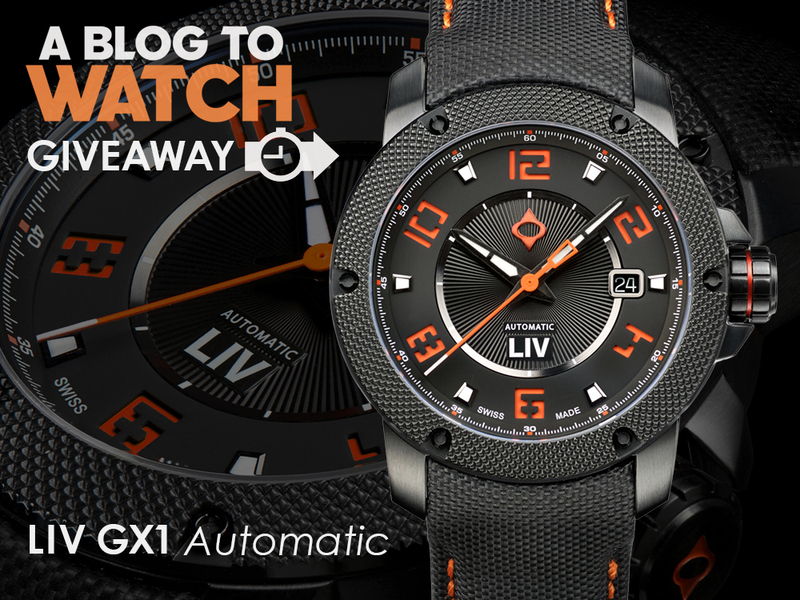 It is hard to say how that would change if Central Watch was to exponentially grow, but for now it is among the more friendly watch service providers you can trust to have a good relationship with. Some of the watch retailers nearby could learn a thing or two about down-to-earth customer interaction rather than the all-too-common 5th Avenue snobbery. In a large sense, Central Watch is modern vestige of the past. It doesn’t matter how popular mechanical watch sales are today – getting things repaired or serviced is something we barely do. Aside from our cars, there is almost nothing we own that people regularly take into the shop to get worked on. In a disposable economy, Central Watch is a pleasant reminder of the past. A time when things were perhaps made with more care, and people understood what was inside of the the things they bought. It is a cool place to go, and if you are in NYC and need to get your watch serviced, I can’t think of any better place. would be interesting to find other “small” watch shops around the country. Well written piece. True story: In the early mid-70s I was a poor Army SSGT. stationed at an Army base in Eatontown, N.J. Its just a short bus trip into NYC and that was a regular getaway. I had a busted crystal on the watch I was wearing and asked the bus driver where he recommended I should go. I found it, went in, showed them my watch and the guy, Larry I guess, asked me how long I was going to be in the city? It was. New crystal, cleaned and looking like new. All for the grand total of US$25.00 remember, this was in 1974 or so…lol. Only time I’ve used the place;but I have looked in over the years when I’ve been going through GC station. Great write up of yet another watch-stop I have to make when I’m in NYC again.